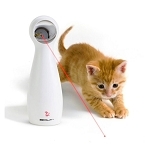 Interactive and laser toys get your kitty chasing, pouncing, and jumping. The toys move in random patterns that simulate prey, entertaining your cat for hours whether you're at home or away. 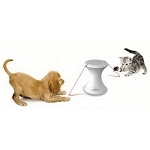 SlimCat interactive cat toys make playtime last longer by dispensing treats or food as your cat plays. Toys with food rewards appeal to cats' natural predatory instincts and give your cat portion control and exercise at the same time.